A two-year-old boy was abandoned at an eatery in Mumbai by an unidentified woman, who the restaurant workers presumed to be his mother. According to the sources, the woman had a meal at the restaurant in Santacruz with the boy, where she sat for at least and hour before stepping out, informing the staff that she will be back soon. No CCTV footage could be recovered from the restaurant and the police is now banking upon the footages to be received from the CCTVs installed in the building which houses the eatery. “The woman, who everyone at the restaurant took to be the boy’s mother, walked out while talking to someone on the phone. The waiters thought that it was perhaps an urgent call and that she would be back in a few minutes. But the boy remained seated alone for a while,” senior inspector Shantanu Pawar of the Santacruz police station told Mumbai Mirror. A female constable looked after the little boy before he was sent to a children’s observation home in Mankhurd. The restaurant staff could be of little help since they could not recall the woman’s face. The police is now attempting to make the woman’s sketch to be circulated in the area. 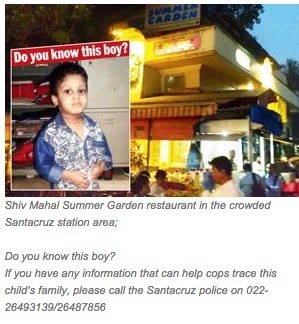 If you recognise the boy in the picture, please contact the Santacruz police at 022-26493139. Can you help this abandoned child? Let us know in our Comment box below.